Easy Horse Care Rescue Centre’s Ron Weeding, right, helps get the young donkey out of the bag. 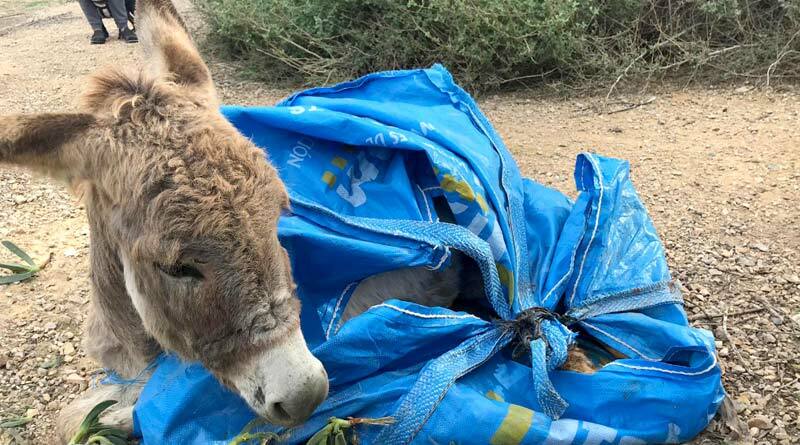 An equine rescue centre in Spain has been left shaken after the loss of a donkey foal who had been found dumped in a plastic bag. It was early on November 14 that Easy Horse Care Rescue Centre co-founders Sue and Rod Weeding took a phone call from a man walking his dog near the Segura river in Las Heredades. He had found a little donkey dumped in a large blue plastic bag. The youngster was covered in faeces with his intestines were starting to come out of his body. He had been unable to move because he was trapped inside the bag that was big enough to cover most of his body. He was transported immediately to Hospital Veterinario San Vicente in Alicante where the team tried to give him a fighting chance. His tired and sad eyes were half-closed almost all the time and he looked exhausted. His rescuers wondered at the horrors such a small creature had gone through during his short life. The young donkey was starved and dehydrated, and he also had a severe case of pneumonia. He stayed at the hospital to receive the best of care. Everyone was hopeful, and Sue and Rod were ready to do whatever it took to give the little donkey a home and a future. But veterinarians discovered that the donkey’s lack of energy was due not only to dehydration and starvation but to a severe case of pneumonia. A set of X-rays revealed that he had blood clots in his lungs. The frail little creature died less than 24 hours after his rescue. The staff at the San Vicente hospital made sure that he felt loved and taken care of during his last hours in this world. He was not even a year old. “We are terribly shaken,” Sue said. So far Easy Horse Care Rescue Centre has been able to rescue more than 160 equines, but this young donkey is the first to have died within hours of his rescue. And although Sue and Rod have worked with the police in extreme cases of abandonment and neglect, the conditions in which this donkey was found are some of the worst they have seen. Veterinarians at the Hospital Veterinario San Vicente in Alicante work to save the young donkey. After his story was shared on social media, many people sent kisses to this poor creature. Sue and Rod decided to name him Kisses because that is one of the many things he needed to feel loved. “We just hope the story of baby Kisses helps us highlight the importance of animal rights not only in Spain but in the world,” Sue said. Easy Horse Care Rescue is the only officially registered horse rescue foundation in Spain. Located just outside Rojales at Partido Lo Garriga, 59, the Easy Horse Care Rescue Centre opens to the public on the first Sunday of every month between 1pm and 4pm. Visit www.easyhorsecare.net and on Facebook at @EasyHorseCare. The young donkey as he was found by the Segura river.